I can see some teachings on leadership and teamwork here. Moses took the lead by delegating some of the responsibilities. He gave the order to ask Joshua to choose some men to go and fight. He entrusted the task to Joshua. He trusted Joshua’s decision on whom to choose. He took along his elder team. He trusted God, Joshua and the fighting men, that they would do their best on the battlefield. Then Moses committed himself to do what God called him to do, to stand at the top of the hill to pray and to inspire. Spiritual leaders need to delegate. They need to entrust the mission to others. They need to garner the support of their elder team. They need to trust God that God will help those who are call to stand up in their role. How hard it is to trust other people when it comes to leadership. As leaders we want to delegate leadership and at the same time we don’t trust those who Christ has raised up to lead. We want to groom the leadership candidates endlessly to make sure they will consistently keep the vision of the founding fathers, and the framework. The grooming process may take 30 years or more. (Sometimes it never happens.) But leaders need to pray and find God’s choice and trust God’s choice. They need to trust the third generation leaders that the second generation leaders have chosen. Then the leaders, along with the elders, need to work together to serve in ways that support and inspire. May God raise up Christian leaders like this, who can fight the spiritual battle along side the new generation of followers of Jesus, trusting God and trusting the newcomers. The location of Israel’s first official battle was a place called Rephidim. At Rephindim this fledgling nation gained their first victory. The name Rephidim likely means rest or stays, in other words, “resting place.” The Israelites were a long way south of the land of Canaan and they were heading away from it. Rephindim was a stopping point for the Israelites as they made their way from Egypt to Sinai. They would have had their hearts set on finding some rest. When the Israelites entered the region, the Amelekites moved fast to rob them of their time of rest, attacking the people of Israel without any provocation. They were determined to exploit them, but little did they know, that they were making moves against the wrong group, for the Lord God Jehovah was their God. And God was going to bring about a great victory. Isn’t that how things are in the spiritual world? When we think it is time to rest then, a spiritual a battle comes our way. Abram, when he thought he could rest in the land of Canaan, was faced with a famine. Jacob and his family wanted to settle in Succoth and then the whole issue with Dinah and the prince of the land occurred. Satan is always prowling around like a roaring lion searching for someone to devour. This is the reality of spiritual life in a Fallen world. We just need to remain in Jesus and be ready to follow his lead and know that our eternal rest will come when we see Jesus face to face in the Kingdom of God. The Lord gave victory to his people through four avenues, Moses’ leadership and prayer, Joshua’s leadership, the Israelite army’s willingness to submit and fight, the elder’s support, and above all, the Rock of our Salvation, the Lord God Almighty. Let’s see. When Moses saw the Amalekites, he knew saw the writing on the wall. His people would have to fight. There was no away around it. And so he sent Joshua out with some appointed men to face the enemy. When the Amalekites attacked, Joshua led this small, inexperienced army out with a heart full of faith. Joshua and his army won a great victory by the grace of God. Please note, it was Joshua and his army. Leaders cannot lead unless they have followers and those supporting them. It is never a one man show. God was growing Joshua. As the general of the Israelite army, he was gaining valuable experience for the greater battles in the future. Later on, he would be the one to bring God’s people into the Promised Land. God was maturing the faith of the fighting men and the Israelites. During the battle, Moses made his way to the top of the nearby hill overlooking the battlefield. As the battle raged, Moses stood with his staff in hand. But it was not just Moses standing alone in the place of prayer. In verses 10-13, we see that Aaron and Hur stood by Moses’ side holding up his arms. The upheld hands signify total dependence on the Lord. Whenever Moses held his staff in the air, the Israelites below gained the upper hand. Whenever Moses let his staff down, the Amelikites would start to win. Therefore Moses kept his staff in the air. This was so hard to do. His aging shoulders burned with every second they were extended. He couldn’t eat or sleep while the battle was going on. And so Aaron and Hur supported his weakening arms. We need to rally around our spiritual leaders to lift up their hands. Shouldering some responsibility, giving words of encouragement, offering up prayers, etc. These are ways that elders can refresh and strengthen spiritual leaders in their work. But it was not just about the human efforts of Moses, Aaron and Hur. What about that stone that Moses was resting his arm on? Look at verse 12, “When Moses’ hands grew tired, they took a stone and put it under him and he sat on it. 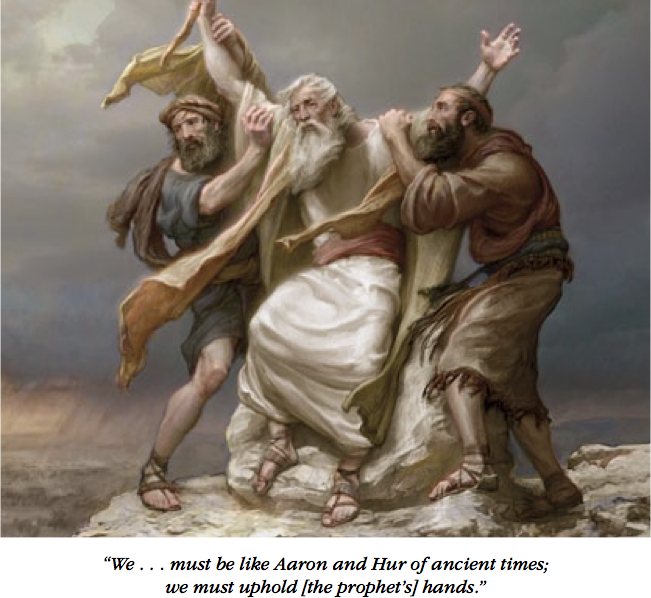 Aaron and Hur held his hands up—one on one side, one on the other—so that his hands remained steady till sunset” Without that stone for Moses to sit on Aaron and Hur could not have kept Moses’ arms upheld. They too would have succumbed to fatigue. They all needed help. They needed the rock. Moses’ exhaustion portrays, the fact that our own efforts will soon result in spiritual burnout, even if we are supported by other people. We need “the stone” to sit on. The Lord God Almighty is the Rock of our salvation. Once we know enough to “sit on the stone” by faith, this victory is ours. Unfortunately most Christians are trying to hold up their hands, possibly depending on other people to help them, but not fully trusting in and resting in God. Anyone who tries to fight the spiritual battle by their own personal strength, even depending on other people alone, will eventually fail. We need the Rock, Jesus Christ. What was God trying to teach his people of all time, through this battle? There are so many valuable nuggets of wisdom. First, God taught them that he was in their midst. Sure there was Moses and his upheld staff, but the truth is the power was not in the staff itself, nor was it only in Moses, but it came from God who was moving among the Israelites. The staff served as nothing more than a sign of his presence and power. Israel’s army would not have been able to triumph over the Amalekites without divine intervention. For theses formers slaves to defeat such a warlike nation as the Amalikites was more than enough proof that God was with them as he promised. Second, they needed the mighty power of the Lord. Over two hundred times in the Old Testament, God is referred to as “the Lord of hosts” (Battles of The Bible. Leston. 2014) This title refers to the power of God over all creation. The Lord of hosts means that God is the Commander of the heavenly army and has power to vanquish any foe. The Lord of hosts was more than able to lead his people to certain victory and his did in this passage. Remember also, the battles you fight today, will bear some sort of fruit tomorrow. The outcome of the battle affected the future of Israelites. The Israelites won this battle but they did not completely destroy the Amalekites, and because of this, the people of Israel would face them again in battle again and again. Never the less, their victory allowed their nation to continue moving forward through the desert, strengthened and equipped to fight even greater battles in the future. God felt that the events of this battle needed to be remembered. Moses was to “Write this on a scroll as something to be remembered.” The command was to write about the great victory that the Lord brought about in a book….and not just any book. It was to be on a scroll that was to be preserved and remembered from generation to generation. It was to commemorate the grace of God shown to his people. This verse points to the birth of the Bible as a written book. I pray that I may never forget the grace of God poured out on humanity through the cross of Christ. Nor can I ever forget the grace of God poured out on my life continuously. I can never forget the grace of God poured out on the ministry to Northern Canada. It must all be commemorated and told generation after generation. God wanted Joshua to hear about what Moses was to write on the scroll. Look at verse 14b, “…and make sure that Joshua hears it, because I will completely blot out the name of Amalek from under heaven.” Why did God want this to be said to Joshua? It is safe to say that God was concerned with the spiritual condition of Joshua. I can think of two reasons why he was concerned. First, God wanted Joshua to keep a humble heart. And second, God wanted Joshua to know that his efforts are accepted by God and God himself will complete what Joshua could not complete himself. Second, God wanted Joshua to know that his efforts are accepted and God himself will complete what Joshua could not complete himself. Joshua may have also lamented the fact that he did not completely annihilate the enemy. God may have seen this condition of heart and wanted to tell him and his army, “You tried your best. I acknowledge that. Don’t worry. I will make sure the job will be completed.” God himself will make sure that there will be complete victory against the Amalekites one way or another. Victory is in the Lord’s hands and not in ours. It would be accomplished by the power of God. We may try to accomplish some mission, and we may even do our best. But our best human efforts cannot complete the task. Jesus comes through and brings about his complete victory. Try your best and let God do the rest. Offer up your five loaves and two fish to feed the nations. Have the faith of a mustard seed. With the Lord, I know that he can work through me. He can complete what I could not complete on my own. I can see how God is leading me into all the right places in our church’s foray into Native ministry. It seems that we are experiencing one timely “bull’s eye” after another. This is not of my doing. It is only Jesus with the team helping us to complete the mission. Moses built an altar and called it, “The Lord is my Banner,” for hands were lifted up to the throne of the Lord. (17:15,16) Here we are introduced to altars and banners. Altars have been altars of thanksgiving, altars of grace associated with the grace of forgiveness and the grace of victory and being able to start all over again with a new beginning. Lift high the banners of love, hallelujah! Sound the trumpets of war. Christ has gotten us the victory, hallelujah! Jericho must fall. The body of Christ is an army Fighting power unseen. Bringing the captives to freedom. In the Name of Jesus, our King. 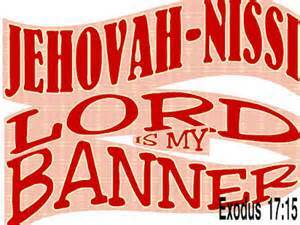 Here are some Biblical verses about banners. And so let’s put it all together. This altar is the banner of God’s love and grace to his people. Though this is a fallen world and to live a Christian life is never easy, we must not despair nor give up hope. We have a banner. This banner is meant to gather God’s people far and wide to come to the Lord and rally before his throne as the body of Christ to live in the victory he brings. Raising a banner is saying, “It is time to gather. It is time for the people of God to rally in the name of our Lord. It is to enter into his victory and to enter into his sanctuary. It is a unifying call for the body of believers to glorify the Lord together. He is alive and with his people. He is saving his people by his right arm. The Lord is our banner. Jesus is his name. This banner is lifted for us today. Therefore come people of faith, it is time to rally together around the throne of God. Gather around Jesus Christ. Live in his victory, Enter into his courts with thanks giving and praise. Raise high the banner of love for Song of Songs 2:4 reads, “Let him lead me to the banquet hall, and let his banner over me be love.” Jesus is our my banner. Prayer: “Lord, thank you for the spiritual battles in life. They are tough but very fruitful. We rally around Christ. Work through us as your people to shine your glory around the world.” . One Word: Rally around the Lord our banner.